Travel down The Cowboy Trail where the Old West is still evident in the art, history, food, hospitality and culture of the foothills residents. Spend time taking a trail ride, savour the scenery and catch up on your history in wonderfully designed and presented interpretive centres like the UNESCO World Heritage site at Head-Smashed-In Buffalo Jump. First a hearty breakfast at your hotel, then off on a full day of activities in Calgary. After a stop at the Canadian Wilds Exhibit at the Calgary Zoo you visit Heritage Park Historical Village. Heritage Park is a real frontier town. And the people are as real as their town. Your last stop for the day is dinner at Ranchman’s Restaurant which is often referred to as Canada’s Greatest Honky Tonk and Country Night Club. Overnight at the Sandman Hotel, Downtown Calgary. You start day two with a dining experience that features the Calgary Tower's famous revolving dining lounge. From here you journey down The Cowboy Trail. The Old West is still evident in the art, history, food, hospitality and culture of the foothills residents. Along the way, you may see cowboys out herding cattle, sometimes right along the highway, and families out for a horseback ride. This area attracted First Nations peoples thousands of years ago and Alberta’s first ranching families settled here in the 1880s, transforming the rolling grasslands into cattle country. 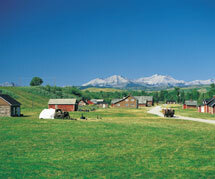 You will stop for lunch and a visit at the Bar U Ranch National Historic Site. This 367 acre ranch, consisting of 35 historic structures and Visitor Orientation Centre, is situated along Pekisko Creek. Then you’re to Waterton Lakes National Park. Overnight at Waterton Lakes Lodge, Waterton town site. If you have selected the rodeo option as a part of your travel package (must include a Friday, Saturday or Sunday) day three sees you head off to attend a rodeo and/or powwow. At the conclusion of the rodeo you head home to a terrific dinner, and another restful night at the Waterton Lakes Lodge. Or you may decide to take a trail ride, white water raft, or explore the beautiful scenery on a mountain trail hike. Day four is another day of fascinating sites and activities. Your first stop is the UNESCO World Heritage Site, Head-Smashed-In Buffalo Jump, which is one of the world's oldest, largest and best preserved buffalo jumps. Then you’re off to the Crowsnest Pass. The natural beauty of this area makes it one of the best wildlife areas in Canada, with rocky mountain bighorn sheep, moose, elk, deer, grizzly bear and black bear making their natural habitats here. You will be stopping at Eckardt’s Tecumseh Mountain Guest Ranch where the specialties include authentic wild game, German cuisine, freshly baked German bread and dessert offerings. Once you have finished lunch, you can go on a trail ride, savour the majestic scenery on the beautiful hiking trails as you watch for birds and wildlife, or just sit back and soak it all in. Then it’s back to the cozy surroundings of the Waterton Lakes Lodge. Your first stop after breakfast on day five is the North-West Mounted Police (NWMP) Museum in Fort MacLeod. Since their beginnings in 1873, the Mounted Police have gained world wide recognition for their role as a police force. Today you will share in this tradition while viewing one of the daily performances of the Museum's NWMP Musical Ride. Then you’re on the road back to Calgary. Your return route will take you through the Kananaskis Valley, and a stop at Boundary Ranch. And at the end of your day you arrive back in Calgary.